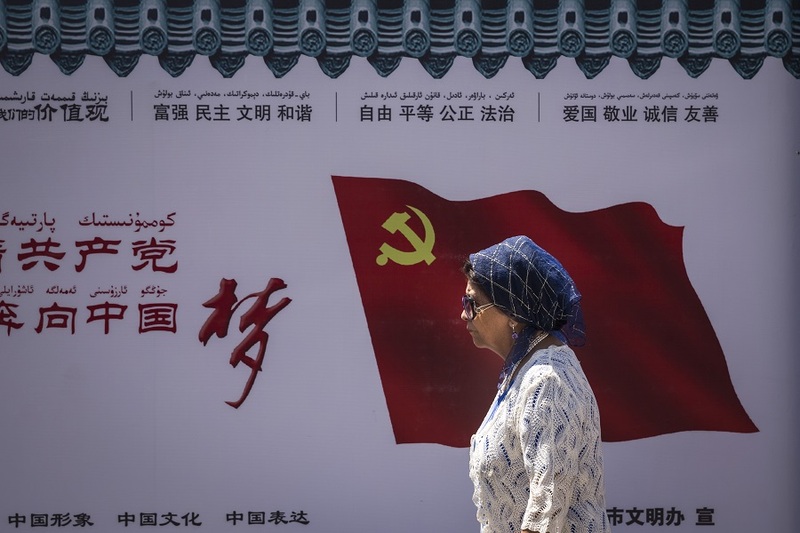 A Uighur woman passes in front of the Chinese Communist Party flag on a wall in Urumqi, Xinjiang Uighur Autonomous Region, June 27, 2017. How Should the World Respond to Intensifying Repression in Xinjiang? The mass, extra-legal internment of minorities in Xinjiang—including 5-10% of the Uighur population—should be met with global condemnation. Every business, non-governmental organization, and government that interacts with the People’s Republic of China (P.R.C.) risks its integrity by remaining silent on the internment camps and the racist system of cultural cleansing that the camps support. Nonetheless, the prevailing response is, for the moment, silence. China watchers have an important role to play in ending this silence. More than a decade of dialogue and argument has failed to persuade P.R.C. officials to abandon repressive policies in Xinjiang. Any effective response will have to be broader and more forceful than the urgings of the recent past. Diplomats and foreign policy specialists must support bold initiatives, including sanctions, to convince P.R.C. leaders that the humane treatment of minorities is in the Party’s best interest, not just morally imperative. China, like the U.S., has opted out of much of international human rights law, but legal experts should explore ways to hold the P.R.C. to international norms. Businesses such as Kraft Heinz, which sources tomato paste for its ketchup from state-owned enterprises in Xinjiang, will have to determine how much their products contribute to the maintenance of the totalitarian police state in Xinjiang. The International Olympic Committee and Olympic athletes will need to consider whether the Olympic goal of “building a better world through sport” can be accomplished in 2022 if the host country, China, maintains an Apartheid-like system for certain minorities. Countries around the world should welcome the handful of Uighurs and Kazakhs who manage to escape China. But such a robust response will never emerge without greater awareness. Even the existence of the Uighurs and other minority groups of Xinjiang is not broadly known, and widespread Islamophobia has made it easy for the P.R.C. to camouflage its repression in the language of the War on Terror. Recognition of the tragedy unfolding in Xinjiang has thus grown gradually, emerging first from those closest to the ground: the Uighur and Kazakh communities, scholars who study Xinjiang, and the handful of foreign journalists who have recently visited the region. Some of the reporting by these groups has undoubtedly reached influential policy actors directly, but wider awareness will only emerge if general China experts—on whom NGOs, businesses, news media, and governments depend—make Xinjiang an integral part of the China story. Analyses of general topics such as the media, gender, or rule of law in China should fully incorporate discussion of Xinjiang and Tibet, rather than treating these regions as exceptional. The current legal system of the P.R.C., for example, must now be understood as one that varies along ethnic lines, and one that permits sudden extra-legal innovations on a grand scale, in this case the enormous new network of indefinite detention camps for purportedly suspicious groups. It is tempting to restrict studies of the P.R.C. to data from Han-majority areas because of their overwhelming influence within the P.R.C., but any understanding of China is distorted without a consideration of the minorities with which the Han majority is intertwined. Such distortion helps keep the gross injustices in Xinjiang invisible, and risks enabling an even darker future, foreshadowed by the stories of torture and deaths that have already begun to emerge from the internment camps. In 2014, Xi Jinping visited UNESCO headquarters and delivered a speech on the value of cultural diversity and equality in China’s “Western regions,” signalling the links China was making between intangible cultural heritage (ICH) and the Belt and Road Initiative. China has long used the UNESCO heritage lists to enhance its international prestige. It is a major partner of UNESCO’s ICH projects, with the largest number of ratified ICH items worldwide. Among them is Meshrep, a form of community gathering amongst Uighurs, which was ratified in 2010. Since then, Meshrep has been transformed from community gathering into song-and-dance spectacle, used to promote tourism, and deployed as part of soft diplomacy and investment initiatives. This has happened against a backdrop of extraordinary levels of surveillance, intervention into the daily lives of millions of people, and mass incarceration. Knowledge of what is happening on the ground is severely hampered by the “Great Wall of Iron” Xi Jinping ordered erected around the region, cutting off access for foreign journalists and researchers and severing contact between overseas Uighurs and their relatives within Xinjiang. Even so, we know that grassroots Meshrep have been conflated with “illegal religious gatherings”; villagers have been unable to organize Meshrep, and universities have forbidden students from attending informal Meshrep. Refusal to attend officially organized Meshrep, on the other hand, is taken as a sign of religious extremism. We know of several researchers and transmitters of Uighur heritage who have been detained. China’s “safeguarding” of Meshrep thus involves separating the practice from its community roots, and creating versions that promote repressive government campaigns. It is part of state policies that actively impede and disrupt local forms of community organization and expression. UNESCO ratification allows the Chinese government to present itself as protecting Uighur heritage, masking the reality that securitization policies severely hamper the practice and transmission of that heritage. Chinese media frame China’s ICH policies as “saving” Uighur heritage from foreign influence and religious extremism. On the contrary, the principal threats to Uighur heritage are government policies including the shift to Chinese-language education in schools, the relocation of Uighur communities to make room for development projects, restrictions on religion and informal gatherings, and the mass incarceration of Uighurs in re-education camps. UNESCO should raise these issues with China as a matter of urgency, and launch an independent investigation into the situation in Xinjiang to ascertain if the conditions necessary to safeguard ICH are present, namely ownership of the process of safeguarding by practitioners and communities, underpinned by freedom of speech, religion, and assembly. A detailed report on Intangible Cultural Heritage in Xinjiang, written by Nicole Morgret, will shortly be released by the Uyghur Human Rights Project. What is happening in Xinjiang at present is arguably the most serious human rights violation in China since the 1989 Tiananmen Square crackdown. Yet, to date, governments across the global have remained largely muted in response. The forced imprisonment of tens (if not hundreds) of thousands of Uighurs and other Muslim minorities in political concentration camps not only violates Chinese law but also international norms against the extrajudicial deprivation of liberty. Article 37 of the Chinese Constitution and Article 9 of the Universal Declaration of Human Rights, for example, explicitly forbid any form of arbitrary detention. Thanks to the meticulous work of scholars and journalists (mentioned above), we now have a substantial body of evidence outlining the harsh realities of these so-called political re-education camps, including coercive brainwashing, physical and mental torture, and the forced denunciation of one’s culture and religion. Some western governments criticized these abuses at the U.N. Human Rights Council earlier this year, and American officials, including the co-chairs of the Congressional-Executive Commission on China, have called for possible sanctions against Chinese officials in Xinjiang under the Global Magnitsky Act. It’s now time for other countries to publicly condemn these camps. Unfortunately, my home country of Australia has thus far remained silent. In 1997, the Australian government decided to pursue an annual, closed-door human rights dialogue with Chinese officials, arguing it would prove more effective in moderating Beijing’s behavior. This strategy has failed miserably. China has become a far more repressive place under Xi Jinping, and in 2015 the Chinese government made a unilateral decision to walk away from these annual human rights meetings with Canberra. If we are unwilling to publicly name and shame Beijing, we have little hope of changing its behavior. In 2017, the Turnbull government warned about the dangers of a “coercive China,” but has subsequently pulled its head back in, fearing Chinese reprisals. The Australian government is now under immense pressure to “reset” its relationship with China, with tacit calls to set aside values and principles in order to pursue “win-win” economic collaboration. Since 1989, the Chinese Communist Party has worked hard to redefine human rights as a morally and culturally relativist concept, suggesting its “China model” of hierarchical inclusion means not all citizens’ rights are equal and the interests of the individual can be quashed for the utilitarian good of the nation. By overlooking human rights violations in China, such as those occurring in Xinjiang today, we undermine the moral authority and universality of these rights, and permit Xi Jinping the physical and discourse space to not only perfect his authoritarian controls at home but also begin exporting them abroad. All agree on the need to engage with China, but we must do so in a considered and principled manner, as Sophie Richardson, China Director of Human Rights Watch, recently pointed out. The best way to deal with a bully is regular, consistent, and public shaming. A symbolically powerful step the U.S. government should take—and one for which the mechanisms are already in place—is to sanction Xinjiang Party Secretary Chen Quanguo under the Global Magnitsky Human Rights Accountability Act. The U.S. Congress created the Global Magnitsky Act in response to the death of a Russian accountant who died in prison after exposing high-level government corruption there. It allows for the United States to take two potential actions against foreign persons found to be responsible for human rights violations: blocking or revoking U.S. visas, or imposing property sanctions. Chen Quanguo’s role in dramatically escalating state repression and violence against ethnic and religious minorities in Xinjiang is clear. The Xinjiang regional Justice Department issued a key document mandating the expansion of the incarceration camps in February 2017, six months after Chen became Party Secretary in August 2016. Google satellite images of locations identified from government expropriation and bid notices clearly show that construction of several “re-education centers” began in the first half of 2017. In addition to the massive expansion of the political education centers, his tenure in Xinjiang has also brought omnipresent security checkpoints, as well as tremendous increases in security spending, security personnel hiring programs, and government procurement and construction bids. As the highest-ranking Chinese Communist Party member in Xinjiang, Chen Quanguo is the most powerful official in the region and ultimately responsible to Beijing for what occurs in his jurisdiction. The lines of authority in the Chinese Party-state mean that Chen is at the very least complicit in these abuses, if not a major driving force. Lest his involvement in the ongoing tragedy in Xinjiang be seen as coincidental, it is worth remembering that this escalation in repressive measures echoes similar spikes in security spending and hiring when Chen was Party Secretary of Tibet. As a former member of the U.S. Intelligence Community, I am trained—and indeed, usually prefer—to focus on analyzing the situation at hand rather than offering policy prescriptions. I know that I can’t see the full scope of U.S.-China relations, and that there are factors beyond any given human rights concern that play a role in U.S. policymaking. In this case, however, the scale and scope of what is happening in Xinjiang demands a definitive and forceful response. The Global Magnitsky Act and an accompanying Executive Order from late last year make it possible to sanction an individual that is “responsible for or complicit in, or [has] directly or indirectly engaged in, serious human rights abuse.” Further, that individual need only “be or have been a leader or official of . . . an entity, including any government entity, that has engaged in, or whose members have engaged in” serious human rights abuse. Chen Quanguo is a clear example of exactly whom the Magnitsky Act was designed to target: an individual who is leading the incarceration of hundreds of thousands, if not millions, of citizens simply because of their religious beliefs. Having followed the rapidly deteriorating human rights situation in China, Tibet, and now Xinjiang in recent years, and having been dismayed by the overwhelming international silence on these shocking events, I welcome this ChinaFile discussion. What should the international community do? What can the international community do? I particularly appreciate Rian Thum’s emphasis on how general China experts can contribute to awareness of these events. It is worth noting that China scholars have been among the quietest parties in their response to the news coming out of Xinjiang. Some have gone even further than silence: in April, the South China Morning Post revealed that two European academics had dropped out of a special edition of The China Quarterly on the topic of China’s far west because they were concerned about publishing their papers alongside James Leibold’s study of state surveillance. The special issue unraveled, losing yet another chance to bring Xinjiang issues to the attention of the broader China-watching community. We all know the reasons for such puzzling behavior—to take a vocal and open stance against human rights abuses in China today of course runs the very real risk of landing oneself on a visa blacklist and thereby losing access to research opportunities, collaborations, and friends in China. And as the political environment continues to worsen in China, no one can really be sure where Beijing’s red line is, with the result that scholars engage in increasingly aggressive self-censorship to protect their careers. Yet no one begins their academic career by envisioning oneself self-censoring for the purpose of catering to an unaccountable and abusive government. And at the end of the day, looking back on these events, how comfortable can one be knowing that one maintained silence about people being sent to camps solely due to their ethnicity, just to maintain visa access? Knowing that what Beijing wants is silence, and knowing that it attains this silence by making individual scholars anxious enough to self-censor into silence, I have worked with colleagues to formulate a response that breaks through both the silence and the pressures by collectively speaking out about Xinjiang. We call it the Xinjiang Pledge. The idea is that people sign on to this pledge, and then at any public talk one does, regardless of where it is being held, one starts the talk by noting: “I would like to bring the audience’s attention to the fact that hundreds of thousands of Uighurs are currently being arbitrarily held in political re-education camps in their homeland in Xinjiang. Facing a situation like this, the community of China scholars cannot remain silent.” Such a public statement is an open disavowal of self-censorship, while also raising greater awareness of the situation in Xinjiang. Our goal is to collect signatures until August, only releasing the list of signatories after a critical mass of more than one hundred scholars (but preferably more) has been reached. If you would like to join in speaking out about the situation in Xinjiang today, please contact us at xinjiangpledge [at] gmail.com . There has been much recent news about the extent of electronic, biological, and human surveillance of Muslims in Xinjiang. While the technology involved in this massive project of control is a matter of concern, we should not allow the spectacular nature of new surveillance technologies to divert attention from the People’s Republic of China’s (PRC’s) drive to control, even quarantine, a segment of its population. As others have noted, nothing better epitomizes this project of control than the extra-judicial and indefinite mass internment of large swaths of Xinjiang’s Muslim population. Those of us who study Uighurs or have Uighur friends all have acquaintances who have been detained or friends whose relatives are in the camps. We know that Uighurs and other Muslims fear being sent to these camps and have asked friends and families abroad to cease contact with them lest such communications result in their internment. Historically, we have seen that the internment of large segments of a country’s population on the basis of ethnicity and religion can give rise to apartheid or, worse, ethnic cleansing and genocide. Given the politically charged nature of the terms ethnic cleansing and genocide, reporters and scholars have been reticent to apply them to the current policies in Xinjiang, but it is also irresponsible to ignore early warning signs. According to the UN Convention on the Prevention and Punishment of the Crime of Genocide, crimes of genocide are not confined to mass killing of an ethnic group; they also include “Causing serious bodily or mental harm to members of the group” and “Deliberately inflicting on the group conditions of life calculated to bring about its physical destruction in whole or in part.” Accounts of Xinjiang’s re-education camps that have emerged over the last six months already seem consistent with these definitions. An independent international investigation of these camps is imperative. Journalists already have collected numerous accounts that such an investigation can seek to corroborate, and a law student in Canada has begun to compile satellite imagery of the camps along with geographic coordinates, which can serve as a means to identify the facilities to be inspected. Such an investigation falls fully within the mandate of the United Nations, especially under the auspices of the UN High Commissioner for Human Rights, the UN Permanent Forum on Indigenous Issues, and the UN Office on Genocide Prevention and the Responsibility to Protect. The position of the P.R.C. on the UN Security Council, of course, creates a serious obstacle to the realization of such an investigation, but a high-level international debate on the issue might push the P.R.C. to close the camps, particularly at a time when it wants to attract the world to its Belt and Road Initiative, in which Xinjiang plays a central role. In a world where populist nationalism is severely weakening the role of the U.S. and Europe in defending human rights internationally, the situation in Xinjiang is an opportunity for the UN to finally play the role that was envisioned for it as a check on the power of singular states and an impartial protector of the universal rights of humankind.